GiftBox Plus - Gift and idea tracker for any occasion. Track gifts given, received, ideas, etc. GiftBox is your complete gift idea and gift tracking software for Palm OS® handhelds, Pocket PC or Windows Mobile handhelds, and Windows PCs! Keep track of each person's birthday, anniversary, clothing sizes, hobbies, colors... anything you want using our customizable fields. Jot down gift ideas for remembering what to buy the next time you shop. Record gifts given and gifts received for all occasions! Also included for reference are lists of anniversary gifts and birthstones. Store Personal Information - keep track of everyone's birthday, anniversary, and custom fields allow you to remember clothing sizes, hobbies, fragrances, likes, dislikes, colors, and more. Store Gift Ideas - large area to enter gift ideas for every person. Track Gifts Given - record gift given, date or occasion, and price paid. Know what you gave them last Christmas or Anniversary. User Definable Choices - define your own list of Categories, Custom Fields, and Occasions to make Gift Box work best for you. 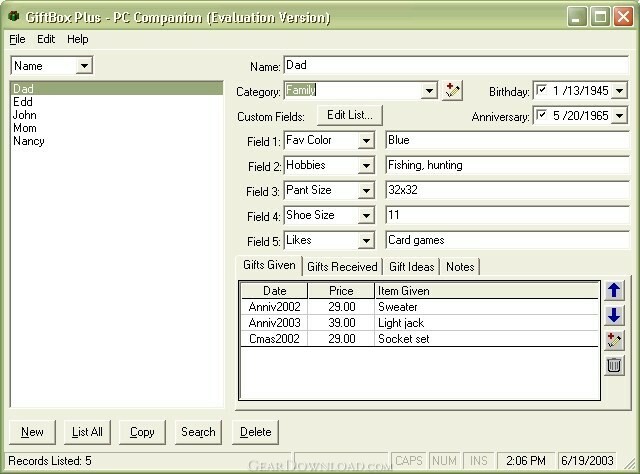 Cusomizable Fields - Gift Box includes five custom fields to allow any type of personal information to be saved for each record. Add Notes - large area to enter notes for every person. PC Data Entry - Add, edit, and delete items on the PC for quicker data entry. This download (giftboxplus-setup.exe) was tested thoroughly and was found 100% clean. Click "Report Spyware" link on the top if you found this software contains any form of malware, including but not limited to: spyware, viruses, trojans and backdoors. Mortgage Loan Interest Manager Pro Linux 7.1.130115 - Is your mortgage one of the thousands being overcharged interest EVERY DAY?